First of all, let me just admit that I get the majority of my news from Mama Pop. It’s an online independent entertainment site that was started by two stay-at-home moms. I can totally dig that. Let me also make it clear that I do not want this blog to turn into a Mama Pop spinoff. I try to keep the news out of it, because we see enough of it as it is, and frankly, I’d rather talk about my garden and baking. But when I read this article, I was brought to tears and have not been able to stop thinking about it. After I read it, I immediately picked up my baby from her crib and gave her the biggest hug I could. So here’s how it went down: This five-month old baby, Sammy, was born with a heart murmur. The parents were treating the murmur at Sutter, but went to the Hospital immediately when the baby got flu symptoms a couple weeks ago. After they were unhappy with the treatment at Sutter (wrong antibiotics, possible heart surgery, and so on), they sought out a second opinion at Kaiser without getting a “proper discharge” from Sutter. The Doctor who treated the baby at Kaiser said that the baby was perfectly fine and was discharged to go home with his parents. While at the hospital, the parents were questioned by the police and CPS and were given the A-OK to go home. The next day, they got a surprise visit from the police and their baby was taken – yes, taken from their hands – for neglect. Since then, the mother has been able to visit her baby once, and the visit only lasted for an hour. The couple were unable to get their baby back and CPS was looking for a family to take the baby. I dug a little deeper and found an article about this on the News 10 website. There was an update today that a judge will hear the case and is supposed to make a judgement today. That’s pretty much all the information I got on this. I don’t know the whole story, but as a mother, I have a million thoughts of what I would do if I were put in this situation. We all say we would severely hurt or murder someone if they tried to take our baby. But what if the person trying to take your baby was actually the authority? Would you risk going to prison? I wouldn’t, I couldn’t. Our babies need us to be there for them, and there’s not a hell of a lot we can do for them in prison. So, I would end up doing what this couple is doing. And wait. If you watch the video in the Mama Pop article, the medical report from Kaiser shows that CPS and the police were informed that Sammy was safe to go home with his parents. So, why did they go back the next day? What neglect was there? Why are they so worried about this couple and not the drug-addicted parents who put their children in harms way every day? Is there more to this story that we don’t know? Maybe. I guess Sutter was a little confused when they told us that they were a “baby-friendly” hospital when we had our little girl. They don’t allow pacifiers in the hospital, but they allow this? Something ain’t right. You can follow News10 on Facebook for updated information. I love fruit. All kinds of fruit. Except apples, which seem to be the gateway fruit for everyone else. Maybe I outdid myself on apples and peanut butter a while back, I’m not sure but I find them to be rather boring now. I did, however, buy a bag of apples so I could make some homemade apple sauce. Then when I got home and put away the groceries, I realized that I already had a huge jar of applesauce. So, what’s a girl to do but to go on Pinterest and find out what else I could do with these apples that nobody will eat. I think I will make the apple and cheddar grilled cheese today and the apple brownies because those look delicious! When I bananas get a little riper, I can make the banana bread and if I have any apples left over, I’m doing the apple butter for my morning toast. So, I can put those apples to good use! 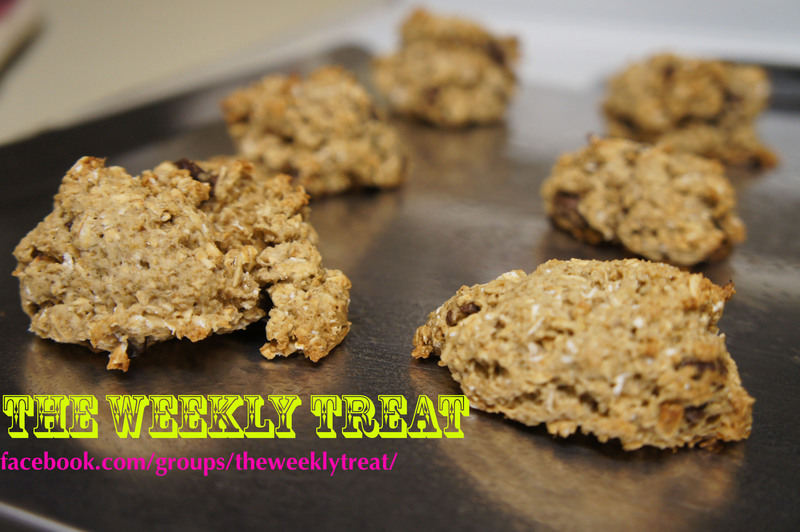 If you love to share and try out new recipes, join the weekly treat on Facebook! A new theme is posted every week. This week’s theme was apples, obviously. A couple weeks ago, I was introduced to what might be the most amazing thing I have ever found, The Grow Write Guild by You Grow Girl. It was started by Gayla Trail and is an online garden journal. Every two weeks, you get a new prompt that somehow relates to your garden. This week’s prompt was: Describe your fantasy garden. Well, my fantasy garden would be in the same place it is now. I love the area it is in, it’s all blocked off and just for my little plants. But there would be more to it. The fences would be lined with avocado trees. There would be a blueberry bush and my strawberries would be out of control. There would be a stone pathway into the garden and there would be a little garden area for Cecilia where she could grow what she chose, and tend to it. Then she would love tending to her garden so much that she would be inspired to tend to mine. I would have a pineapple tree and a banana tree upon entering. There would be flat, dark rocks everywhere and in the middle would be this amazing table with running water streaming down the middle and watering the plants below. I saw the table on Pinterest and it has since gotten lost in the shuffle. But that table will be mine! There would be a bench (of course) where I would read my book and sip tea while the sprinklers did my job for me. 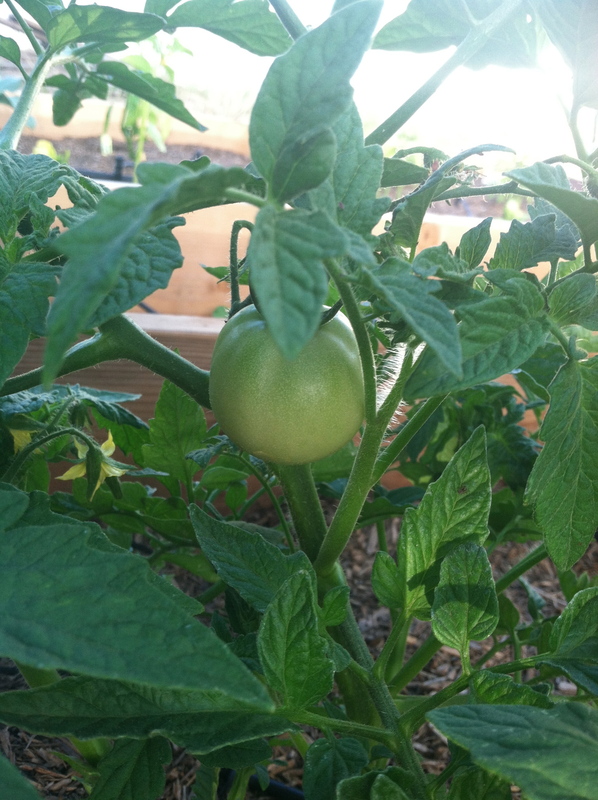 While I’m working on my fantasy garden, here’s how my for real garden is going. 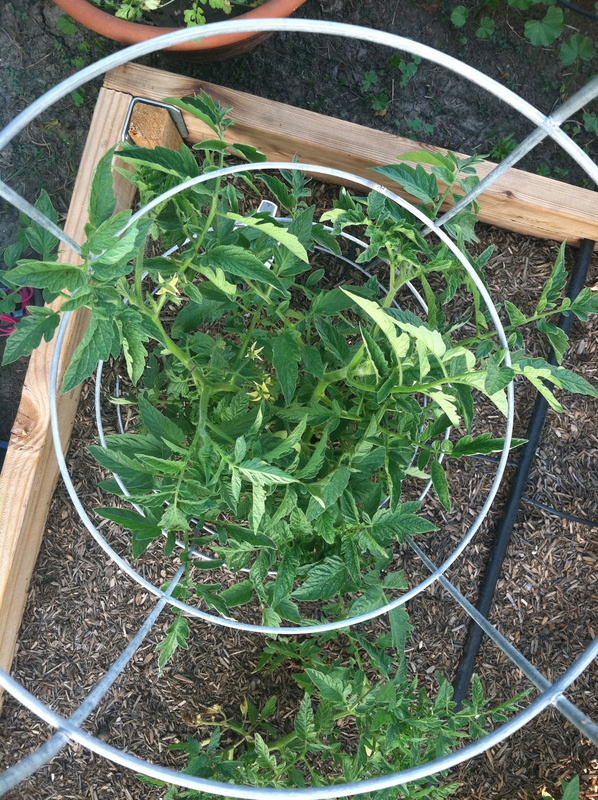 The tomato plants are getting bigger so I finally had to break out the cage. I only have one cage for now, so the biggest plant got spoiled. The others will just have to wait. 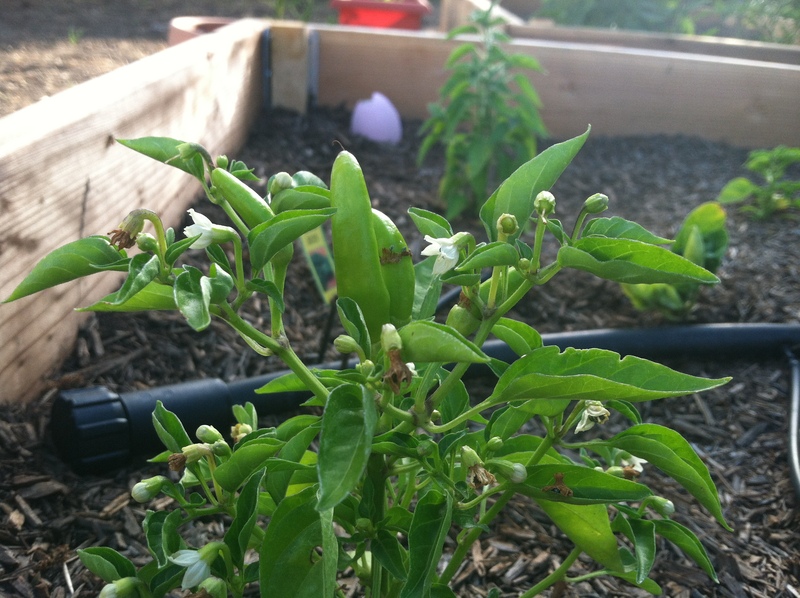 We got in some peppers….sweet! Now for the sad part. 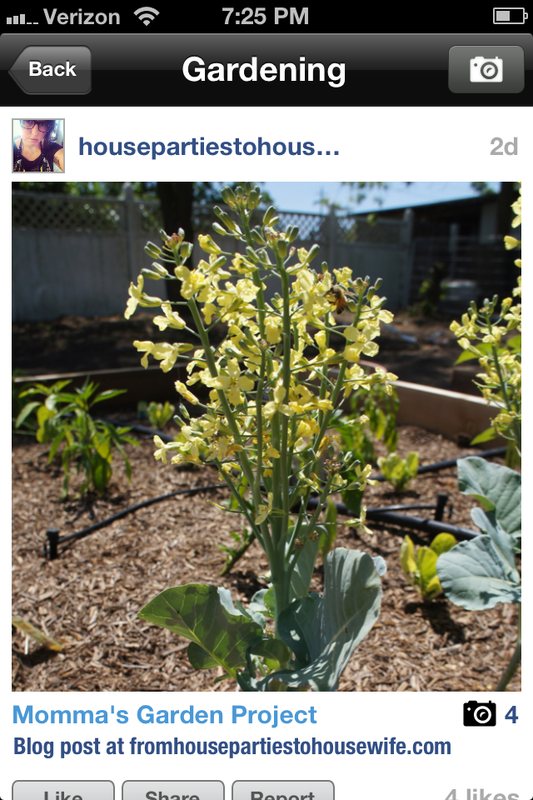 I posted some beautiful broccoli pictures last week, then I was saddened to learn that those flowers in the pictures were actually bad. What? Since when are flowers bad? So, I had to break off that part to let it grow some more. 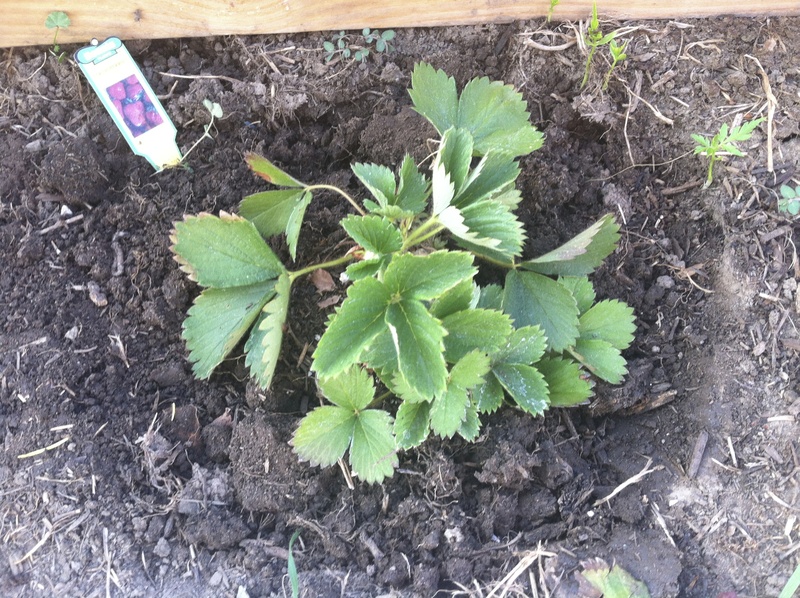 My strawberries took a definite pooper, so I had to take them out of the planter and into the ground. Look at that sad basil. 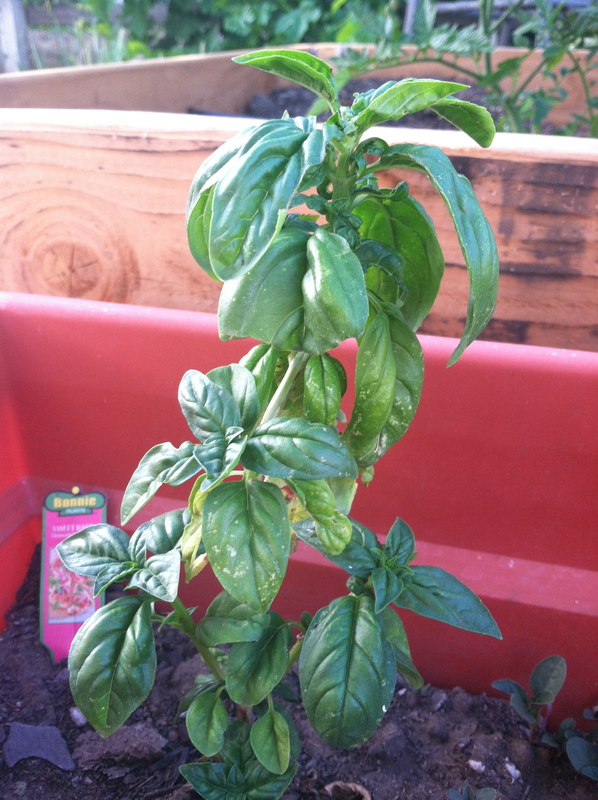 Makes me sad to know my basil is so sad. You can find more fantastic garden ideas on my Pinterest and you can see more garden pictures on my Facebook page. So, how is your garden doing? Dressers. They are awesome when you need them. Almost necessary when you need them. But, when you don’t need them, they are the worst. Huge and bulky, you can’t just store it away somewhere. You have to either give it to someone (there’s almost always someone who needs a dresser) or donate it. Maybe you could sell it on Craigs List. But what if you don’t want to go through all that? Or what if your dresser is so beat that nobody wants it? Well, here are some ideas for what you can do with dresser drawers. So, at least half of your problem is solved, right? There is not much that I love more than when my crafting projects end up in the garden. 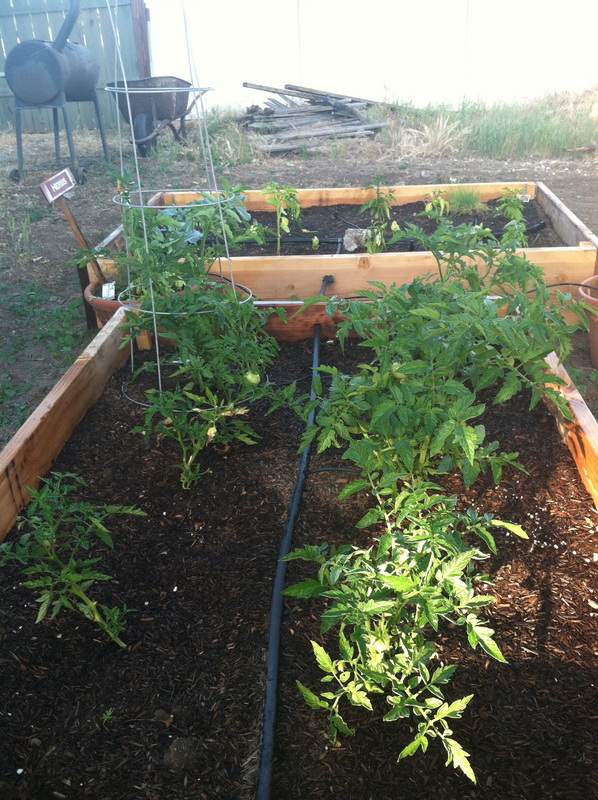 This drawer garden bed idea would be cute for Cecilia’s little garden. 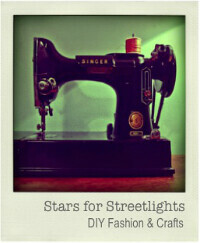 Also, The Hip Girl’s Guide to Homemaking might become one of my favorite blogs. Pinterest might be addicting (bad) but it does get you see what other people are doing, and to check out their blogs. This is probably my favorite thing about Thrifty Thursdays and Fridays are for Favorites, they allow me some time to check out new blogs. I try to not use big companies when I look for tutorials, so the people who are doing it all on their own can get some recognition. Now, the next step would be to actually follow the tutorials. But that’s a whole other story. 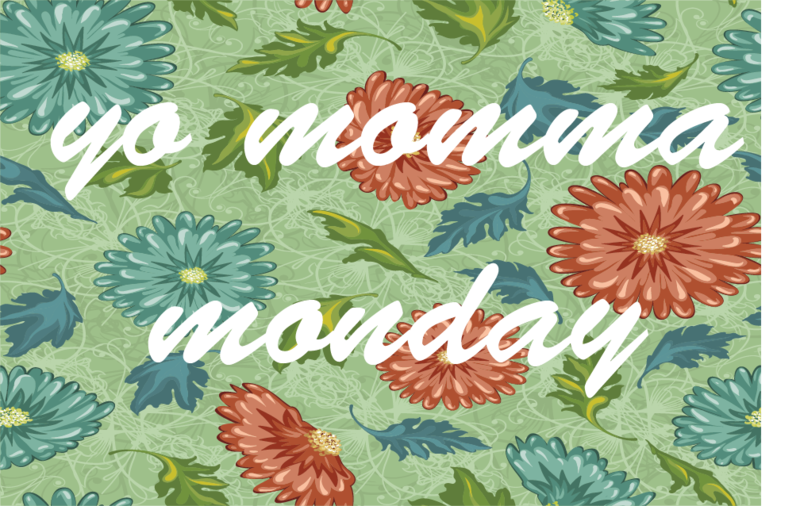 I am starting a new weekly post called “Yo Momma Monday,” where I will profile amazing and inspiring moms. They can also write a guest post is there something special they want to talk about. Maybe they are starting a new small business or non-profit, well they can talk all they want about it here. I would love to be a part of that. So, if you are an amazing mom or you know an amazing mom who wouldn’t mind asking a bunch of questions about herself or writing a little something special, please send her my way. I would love to have a profile or guest post done by Mothers Day, which is in a few weeks. It’s pretty easy…let me know if you either want to be interviewed or if you want to do the writing. I’ll either send you questions via e-mail or we can figure out a topic for you to write about. You send me a picture of yourself and whatever links you would like me to add, and voila! It’s done! We can also do a video interview if that’s what you fancy, you’ll just have to forgive the stutter. It would be awesome if we could get this started soon, so please let me know if you have someone in mind. If you don’t have a blog or website, that’s totally cool. Just send me a few links of who inspires you, and we can add those instead. Hope to hear from you amazing moms soon and keep being amazing! 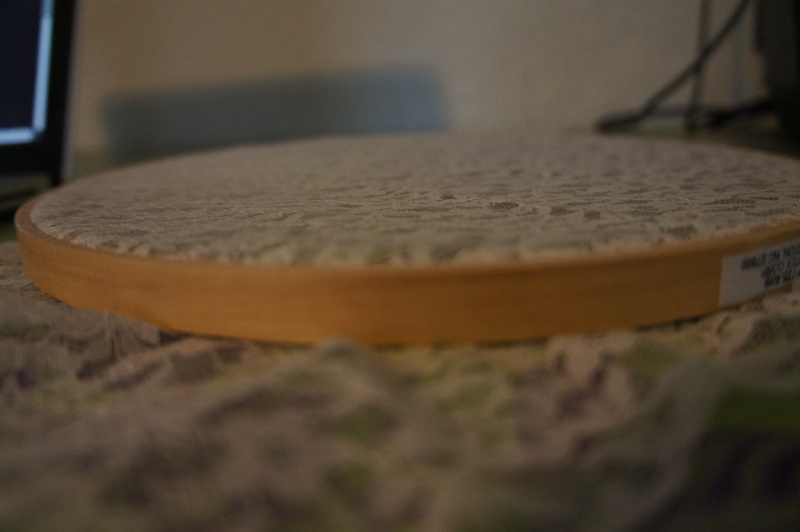 So, I dragged my Yudu out from the closet and got my screen ready to screen print. Then, I realized something. I didn’t have the danged emulsion kit! I swear…this Yudu better be the coolest thing to ever hit the planet once I have everything together. I ordered some emulsion kits online and while I wait for that, I figured it would be cool to try out one of those tutorials I wrote about on Friday. 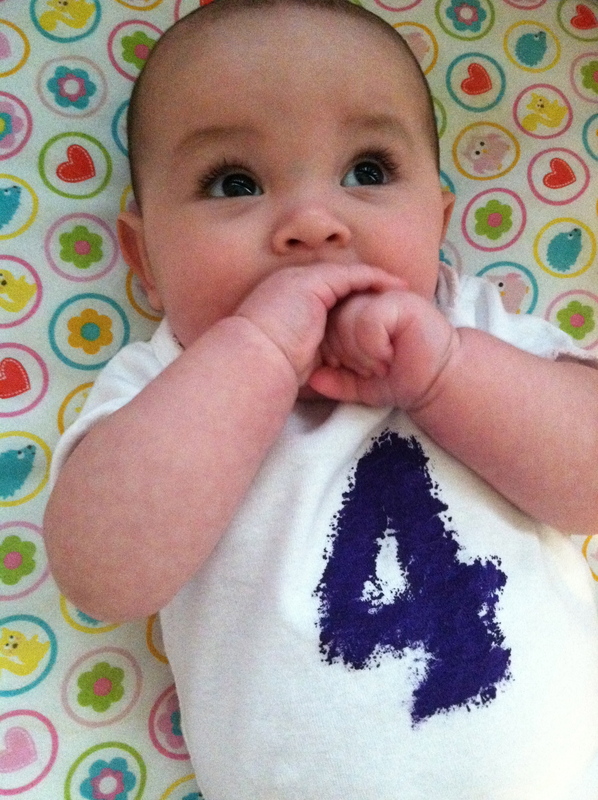 Since I needed to do Cecilia’s four-month picture anyway, I thought that the number four would be the a good starting point. 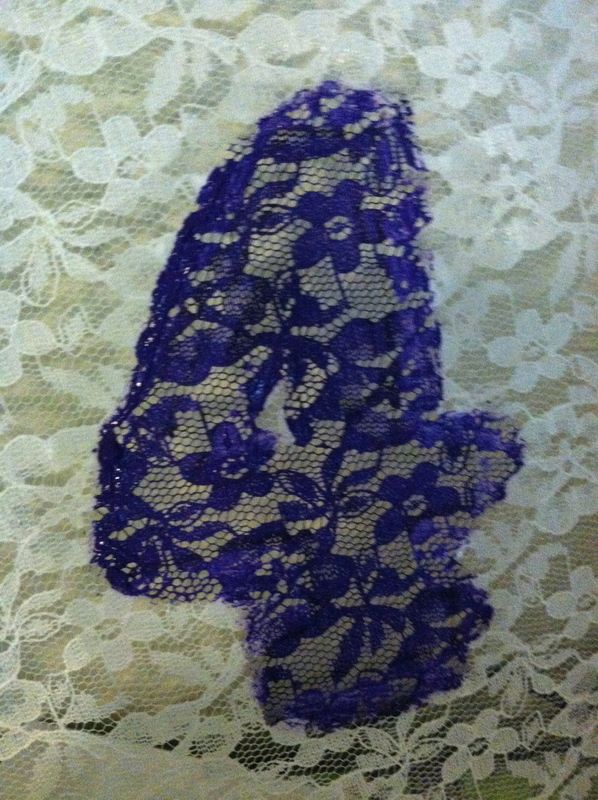 I followed the tutorial from Paper Raindrops and since I didn’t have nylons to use (apparently I hate nylons so much that I don’t even have an old pair lying around), I used some leftover lace I had. Next, I printed out a number four and mod podged the space that I didn’t want to print. I learned that I should have layered the mod podge more, and waited for it to dry completely. I was just so antsy I wanted it done now! Next, I put the screen on top of the shirt and painted the number four with screen printing ink. Luckily, I was able to use my Yudu screen printing ink, so it came in handy for something! It came out a little funky since I didn’t apply as much Mod Podge as I should have and the outline wasn’t so perfect, but it did serve its purpose. I’ll try it again with the number five next month to see if I can get a more defined number, but I think I will save big projects for the Yudu.